Are the Grapes Harvested Mechanically? Harvest started early and with a bang, on August 1st, and then slowed down dramatically with unseasonably cool weather in the early part of the month. It’s probably a good thing – it will give the grapes more “hangtime,” which translates into richer, riper flavors. How do you feel about mechanical harvesting? Visit A Million Cooks for more brief videos from experts on the food you eat: Where it comes from, where to buy it and how to prepare it. Send me your wine question. I’ll get back to you in a jiffy! For a free email subscription go to the top of the page. “Drop crop”… “Green Thinning”… “Green Harvest”… Whatever you like to call it the term is literal and refers to removing green, immature clusters and dropping them on the ground. It may seem a bit obtuse to be removing perfectly viable fruit that isn’t even mature yet, but it’s often done in the name of flavor intensity and it can happen at several times during the growing season. Napa Valley came through flowering quite nicely this year, thank you very much, and the crop is looking good. Vineyard managers should have finished up with springtime shoot thinning by now – a way of keeping the vine in balance. And, now that we have cute little baby grape clusters hanging, it’s time to take a close look. Believe it or not, part of managing a crop destined for fine wine production (as opposed to most wine) is counting the clusters. Yes, literally. 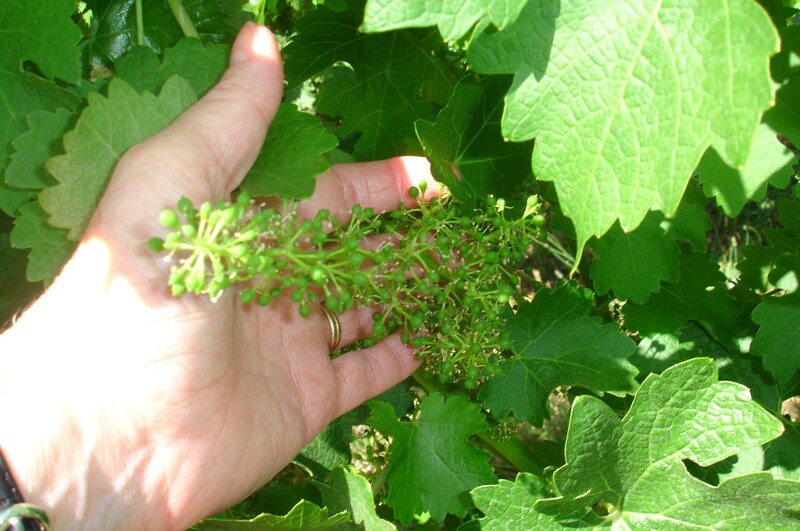 After the lovely weather we had during flowering (rain, hail, high winds and extreme heat can cause problems) there’s a very good chance that there are bonus, unexpected clusters out there. Unfortunately, for fine wine, more isn’t better. If there are far more than expected there’s a chance those grapes will never get ripe, but in our climate, that’s rarely the concern. It’s just that if you add a few extra clusters per vine, the flavors can become diluted. This stuff isn’t regulated but It’s really hard to get $40.00+ for a bottle of Cab that’s kind of thin and lackluster. So it’s quite common to see tiny little clusters scattered on the ground around the vine rows this time of year in Napa Valley. Shoot, leaf and cluster thinning are ongoing activities that begin in April and can continue almost up to harvest time, depending upon how things shape up. Vineyard management has become almost like gardening! Next big event: veraison – when the grapes turn color, probably late next month. Anybody out there making plans to visit wine country and see any of this stuff up close and personal? Walking through the vineyard with a friend, she noticed lots of very small clusters left on the vine, mixed in with the leafy growth. She wondered why they left those clusters behind during the harvest. Those little clusters are a special treat for the birds this time of year. The regular, main crop, is found very close to what looks like the old part of the vine in most vineyards. The crop forms on new growth, but near the old growth, if that makes sense. the way many vineyards are trained these days, as bi-lateral cordons with vertical shoot positioning, you see the main crop hanging kind of like a chorus line, along the lowest trellis wire. The second crop is further up those vertical shoots, hanging off of the lateral shoots rather than on the main shoot. In any case, what I told her is that the very small “second crop” ripens significantly later that the main crop, so if the pickers were to go after it, it would throw the wine out of balance. There would be unexpected tart flavors and, for reds, harsh tannins. The second crop is so small that it’s not usually worth the bother. 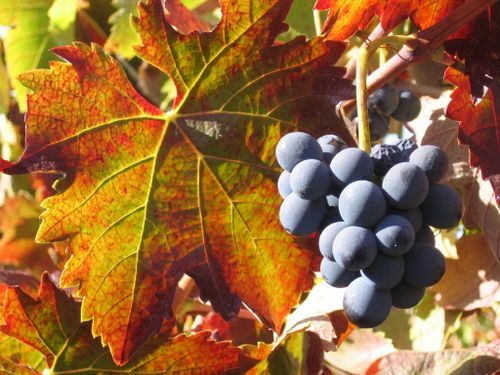 It could be that a home winemaker will ask for permission to harvest the second crop for his wine – if it ever actually ripens, that is. The grapes tasted nice and sweet, but not sweet enough. And the weather is cool, now, with daylight hours getting shorter by the day. So, we enjoyed a few grapes. Other than that, the second crop is for the birds! And, speaking of birds, happy Turkey Day! Cheers! How Long do the Vines Last? Question from Josh: We were in Napa Valley last weekend and noticed more than one vineyard that had been cleared. The stumps were piled up. How long do the vines last? Reply: ‘Tis the season. The grower takes the last crop and rips out the vineyard. I remember sitting by a vineyard with some friends about this time last year when all of a sudden this huge bulldozer showed up and ruthlessly mowed down what looked like perfectly healthy vines. I’ve seen it before but my friends were mortified. There’s no simple answer to your question. 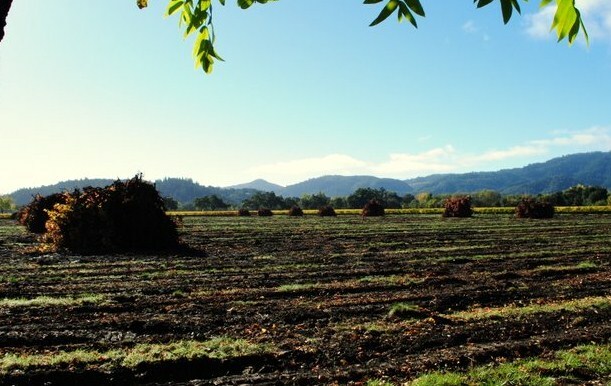 Virtually every vineyard that’s knocked down is still alive and producing a crop. The vines can live a remarkably long time. 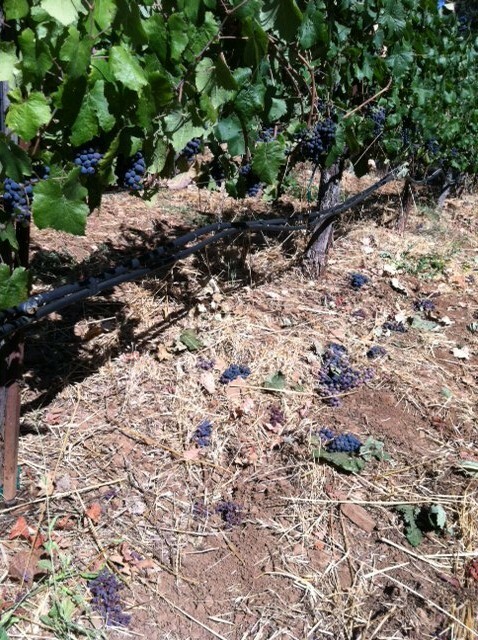 You’ll see some very gnarly, tortured looking old vines that predate prohibition in the Sierra foothills and in Sonoma. Here in Napa Valley they’re out there, too, but it’s more of a hunt. Common practice in old vineyards is to replace individual vines with new ones as they die off. In that case there’s no absolute age for the vineyard. You think of it in terms of average age. There are all kinds of reasons to thin out clusters: For the sake of flavor intensity, to assure the grapes will get sweet enough or to prevent crowding… That’s why you see dried clusters on the ground along with the fresh ones that were just thinned. 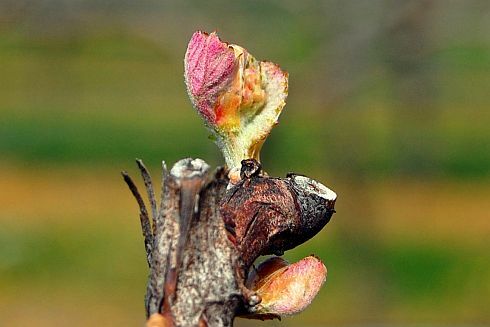 Today’s Wine Word: Bud Break! It’s happening. Mostly in the southern part of Napa Valley at this point, but it’s happening. The vines are emerging from their long winter slumber. Every year I kind of worry because the vines look so very dead, especially once they’ve been pruned. I’m afraid that March will go by and they’ll still look like they’re dead – that they’ll never push out that very lovely little bit of pinky-green new growth. But, this marks the beginning of the 2012 growing season – may it be a MUCH, MUCH better and easier one than 2011! After what the vineyard managers have been through in 2010 and 2011 I think they deserve a frost-free spring and perfect weather from there on. Brrr! Time for a Glass of Port! Are Syrah and Petite Sirah the Same?